Ghost Squad, you know, Global Humanitarian Operations and Special Tactics Squad. Light-gun style games are almost always lacking in content, but feature-rich in replayability. 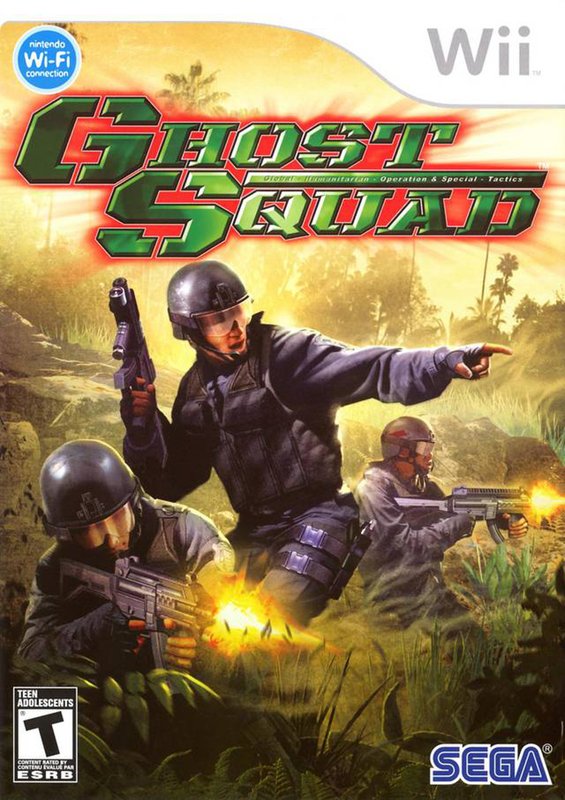 Ghost Squad for the Wii is no exception. It was originally developed by Sega AM2 and released into the arcades in 2004, but was ported to the Wii by Polygon Magic in 2007. I just played through it with a friend and it literally took us less than a half-hour. There’s a handful of reasons to replay the game, but with the exception of one, they’re hard to justify actually do so. That said, this brief experience was a blast as the game was well-executed. Jimmy and Leon and partners, so don’t shoot them! There are three stages in all, and they revolve around the Ghost Squad’s rescue of the POTUS, and their vanquishing of the Indigo Wolves terrorist group. The stages are varied with my favorite taking place onboard Air Force One. Upon his rescue, the President gave Ghost Squad high fives, which was just the best. This game doesn’t have a gripping Tom Clancyesque storyline, let alone one at all, but it has enough of one to string the player(s) along and give them motivation. Which may have been overkill as the game is pure bubblegum fun. 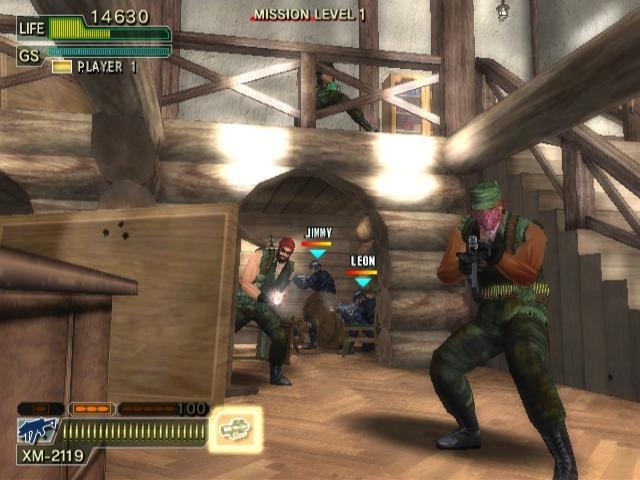 Up to four players can use their Wii remotes like a light-gun prop and blow away the terrorists with a variety of guns and even participate in hand-to-hand combat. The responsiveness and accuracy of the on-screen cursors was perfect and reloading by pointing off-screen was very snappy. The game moves at a quick pace and each stage had many alternate paths, lending an element of replayability. There’s an abundance of unlockable guns, but most importantly there were goofy costumes to obtain. The reason to return to this game is multiplayer though. I imagine this game with four players would be rowdy fun. 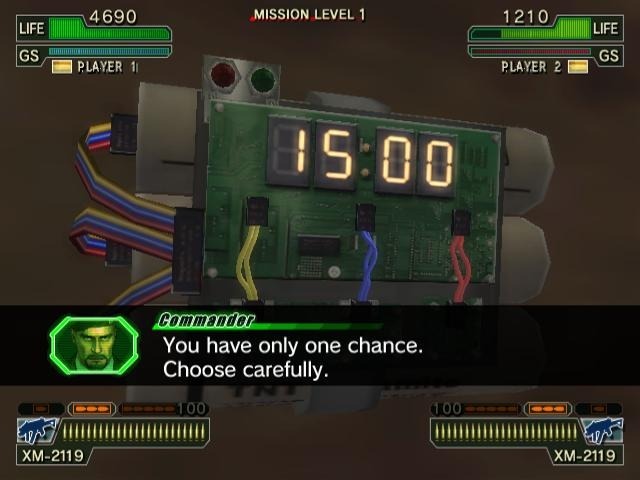 Each stage had multiple events, such as this bomb defusing minigame. Ghost Squad is a surprisingly refined light-gun game. It’s very brief, and light on overall content, but it’s also well made. The pacing is fast and the variety in the gameplay and the environments does enough to keep the experience fresh over the short run time. And, the alternate routes and unlockables were somewhat encouraging of multiple playthroughs. Those should be done with friends though, as the multiplayer is the true highlight. However, the bottom line is that wouldn’t be the case if the source game wasn’t enjoyable. This would be hard to recommend at its original $50 retail, but for the sub $10 it goes for now, it’s worthy of your collection.